The odds of having twins in multiple births are much greater than any other type multiple birth. Around 90% of all multiples consist of twins, the remaining 10% are triplets, quadruplets and sometime quintuplets and more. Recently there has been a large increase in the number of twins being born; This is due to higher maternal ages and assisted reproduction technology and the wider use of fertility drugs. Importantly, better neonatal care means that premature twins have a better chance of survival than ever before. There are two types of twins, identical or monozygotic (one egg) and non-identical or dizygotic (two eggs) twins. 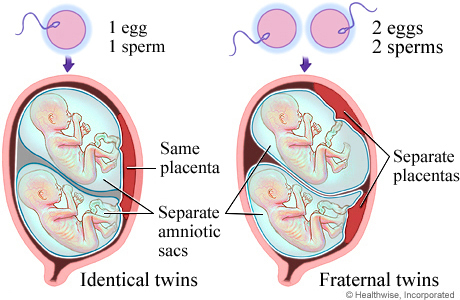 Other names for identical are non-fraternal twins, Non-identical twins go by fraternal twins. How do Identical Twins Occur? Identical twins are created when one egg has been fertilized by one sperm and the zygote splits into two. This happens at the earliest stage of development when the zygote is no more than a clump of a few cells. Dividing this early in conception implies that each baby has the same genetic information as the other. Identical twins can also transpire when one a women have undergone fertility assistance and have had one fertilized egg returne to her uterus. If this egg then splits into two, and identical twin pregnancy can result. Identical twins are not dependent on race, country or ethnicity, the odd of having identical twins are the equivalent for every couple in every pregnancy, where they live in the world. Around one in every three sets of twins born is identical, and the remaining 2/3 is of the non-identical variety. What increases the odd s of having identical twins. Identical twins do not run in the family and can occur for any couple with any pregnancy. Non-identical twins are influenced by genetics, whose mother or grandmother had non-identical twin do have a higher chance of having non-identical twins themselves. But identical twins are random. Some families do appear to have a higher than an average number of identical twins. However, this can only chance to chance and coincidence rather than familial-genetic factors. How do non-identical twins occur? Non- identical twins are uniquely separate individuals who happen to start gestating at the same time in the same place as each other. Two completely separate sperm fertilizes Non-detail twins from two completely spare eggs and. 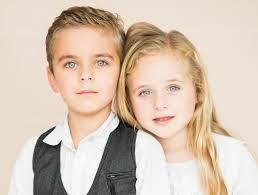 These fraternal twins are no more alike than any other sibling in a family with the same biological mother and father. Because identical twins share the same is, they are was the same gender. But non-identical twins may be the same gender of the opposite because of the only share 50% of the same genetic coding. Some believe that the indicted of having twins skips a generation, but that is not proven to be true. What increases the odd of having non-identical twins? Advancing maternal age. Women who are aged in their 30s and 40s have significantly higher chances of conceiving with twins. Younger women, particularly those aged in their 20’s do not have as much chance. Having reproductive therapy, in particular, taking medication which increases ovulation. This makes perfect sense because of the more eggs which are supported toward maturity every month and which are then released, suggests the more that are prepared to be fertilized. The more pregnancies a woman has already had, the higher her chances of conceiving with non-identical twins. If a woman is fraternal – non-identical twin herself, if she has siblings who are fraternal twins, or her mother or grandmother had fraternal twins, then she is more prone to as well. 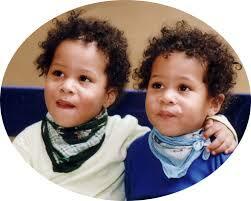 Race – Black African women are more liable to have twins than women from any other ethnic decent. 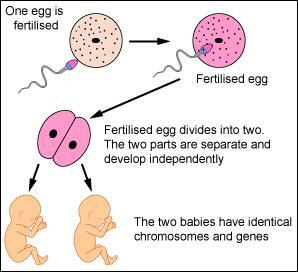 What causes the fertilized egg to separate into two? The exact rationale why this happens is still an unknown, Over the years there has been a lot of examination and research invested into finding out why some zygote split into two and others do not. But the truth is we nevertheless do not know why. In reality, the separating of one fertilized egg is a malformation of the natural processes of conception. When are identical twins formed? Through all identical twins are formed very early in pregnancy, there is some variation in exactly how early the fertilized egg splits into two. This can occur at the two-cell stage on Day 2, the early blastocyst stage on Day 4, or in the late blastocyst stage on Day 5, The stage when the splits into two will determine where the fertilized eggs will implant in the uterine wall. 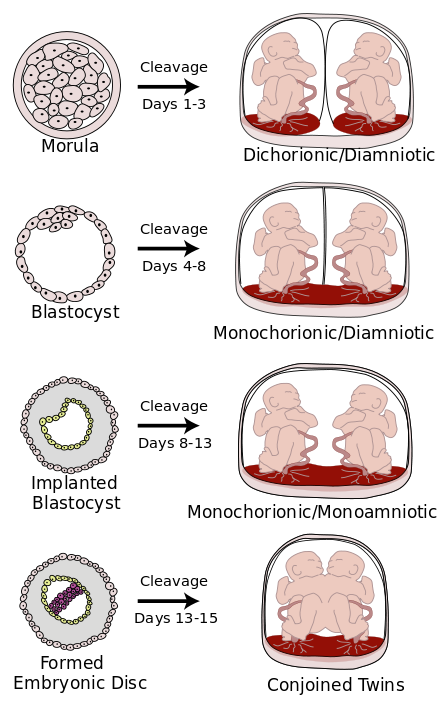 Once the embryo gets to the eight cells, stage the fetal DNA takes over. The stage at which the egg divides will also conclude if the babies have their own amniotic membranes and plant or fi they share. Essentially, the early the eggs breaks, the more independent each twin be by having their own amnion, chorion and plant. 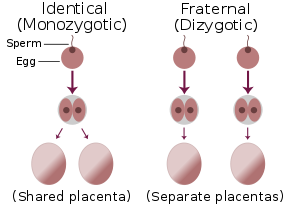 Early separation also means that the Twins are possibly less identical than those who separate at the late blastocyst stage. About a quarter of all identical twins are assumed to be mirror counterparts of each other. This suggests that the left side of one twin exactly matches the right aspect of the other. Although identical twins share the same DBA and genetic coding, they are still unique. Small variations separate them and although at birth they can appear like miniature replicas of each other, they are far from it. As identical twins grow, their unique qualities (particularly regarding their personalities) become more apparent. The environment in which they are raised as well as their own personalities help to shape the adults they will become. This is the same as any other baby born across the world. How will I know if I’ve conceived with twins? Because the splitting of the zygote happens at the beginning of the pregnancy, mothers are not originally aware they have conceived twins. It is not until wins may be suspected because of the strain of pregnancy symptoms, or if they have been diagnosed by ultrasound, that a couple may know they are expecting twins. How obvious are identical twins at birth? Even after the birth, it may be difficult to be sure if the twins are identical or non-identical. Identical twins can be born with their set of membranes. However, this is not a marker for them to be non-identical. It is not always clear simply by looking or examine the twins to now if they are identical or not. The another way to review is to take a blood test and do blood segmentation and grouping; Identical twins will share the same genetic background and information so that the genetic markers will be classified. But not identical twins can have very different genetic markers in the same way as other siblings with the same parents. They share approximately half the same genetic information and traits with each other. What is the risk of Identical birthing twins? If the identical twins share a single placenta, they are at a higher risk of having a twin to twin transfusion syndrome. This ordinarily results in one twin obtaining more nourishment than the other and having a higher birth weight as a result. Umbilical cord entanglement and squeezing if the twins share an amniotic sac. Purely because of the crowded conditions which occur in the mother’s uterus. With identical and non-identical twins, there are increased the risk of pregnancy and birth complications. There is also an increased likelihood of prematurity and associated problems. ← What Is Angelman Syndrome?